Clean Organic Plant-Based Vegan Protein! Absolutely only organic peas, no whey! It’s a vegan protein free of soy, eggs, gluten, dairy and cholesterol. 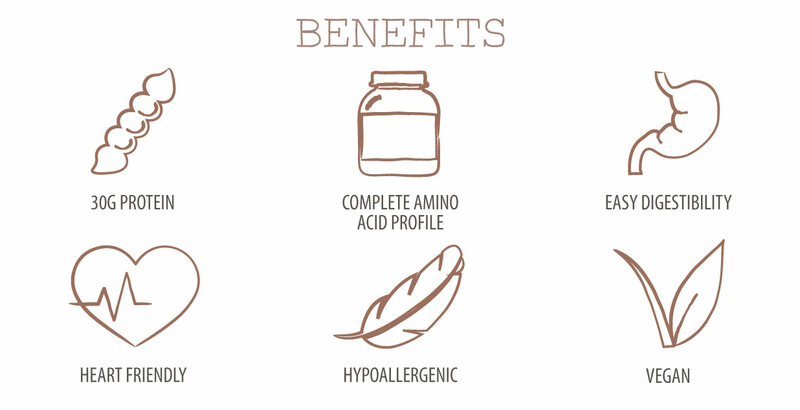 Plus the pea protein we use is non-GMO, hypoallergenic and certified organic. And there are absolutely no artificial sweeteners, preservatives, and emulsifiers. That is why we recommend that you use a blender for better mixability! You can also bake or make delicious smoothies with each flavour available. It’s diabetic friendly too! Organic Pea Protein is a rich source of BCAAs (Leucine, Isoleucine and Valine) which are of particular interest to athletes. Each serving of Unived Organic Pea Protein delivers 5.47g natural occurring BCAAs – to ensure that your workouts are optimally energised, and that your body’s resources are effectively utilised towards the goal of building lean muscle mass & muscle thickness like whey protein. Unived Organic Pea Protein has been formulated with key digestive enzymes to be more than a vegan protein supplement to build lean muscle – it is a scientific nutritional tool to complete your endurance training arsenal. As a completely organic plant based protein, our pea protein has an extremely high digestibility of 98%, making it a rich source of highly bio-available and easily accessible amino acids. Pea protein is also classified as an ‘Intermediate-Fast’ protein . This means that once digested, pea protein is quickly assimilated by the body for protein synthesis, while ensuring that the muscles get a consistent and prolonged supply of amino acids. Unived Organic Pea Protein eliminates the common digestive side-effects like bloating associated with other proteins, and is completely gentle on your stomach – with no side effects. 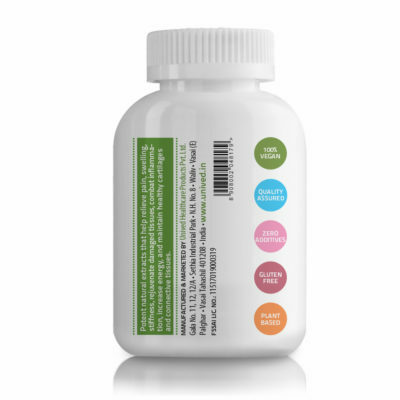 Additionally, we have added natural digestive enzymes such as acid protease, neutral protease, alkaline protease, papain, and amylase. Digestion refers to the breakdown of food into smaller components that can be absorbed into the bloodstream. This digestion or catabolism is divided into two types – the mechanical digestion of food that occurs in the mouth when it is physically broken up into smaller pieces and the chemical digestion that occurs in the gastrointestinal tract when the food is broken down into small molecules by digestive enzymes. Carbohydrate is broken by α‐Amylase into simple sugar. Fat is broken down by Lipase into Fatty acids and Glycerol. Protein is broken down by Protease into Amino acids. We will discuss in brief about Protein Digestion. Every physical action – from stretching our hands to smiling – involves complex and multiple movements of muscles.Protein is one of the most important substances in your body. Your muscles, hair, eyes, organs, and many hormones and enzymes are primarily made out of protein. It also helps to repair and maintain your body tissues. However, not all protein is created equal, and there are things you can do to help your body use it more efficiently. Protein is a very large nutrient that’s made up of smaller substances called amino acids. There are 18 amino acids, but your body can only make 9 of them. The other 9 are called essential amino acids, and you can only get them through your diet. High-quality protein sources contain all nine of the essential amino acids. These are also called whole proteins or complete proteins. Anatomically speaking, our muscles are formed from an intricate matrix of protein fibres. Every flex, every bench press, and every movement of our muscles is the result of these protein fibres working in synchronicity. These muscles fibres are in a high state of dynamic motion in athletes and active individuals, as they are being constantly broken down and rebuilt during exercise. Athletes and active individuals have higher requirements of protein, as the body needs the building blocks to recover from this muscle damage and initiate the process of building new muscle. The sports nutrition research in the area of muscle recovery and growth is unequivocally in favour of protein supplementation, especially for individuals who want to improve lean muscle, and for athletes who undergo rigorous exercise. After intense workouts, the body is starved for protein, and in the absence of additional protein intake, the body may start to leach protein away from muscle. Supplementation with a suitable protein source helps prevent this breakdown of muscle protein, enabling individuals to retain and build lean muscle mass. Additional protein intake is also key to comprehensive muscle recovery after endurance activities – studies have shown that protein aids in the repair of muscle damage induced by high intensity exercise. Supplementation with a complete protein source rich in amino acids also promotes adaptations in muscles in response to training, and facilitates the replenishment of energy stores and glycogen in muscle post-exercise. Proteins are large polymers of amino acids joined by peptide bonds. The peptide bond is an amide linkage joining the amino group of one amino acid to the carboxyl group of another. There are 18 different amino acids found in proteins. They differ in the chemical nature of the “side chain”, R. When several amino acids are joined in this way, the result is a peptide. Protein digestion begins when you first start chewing. There are two enzymes in your saliva called amylase and lipase. They mostly break down carbohydrates and fats. Once a protein source reaches your stomach, hydrochloric acid and enzymes called proteases break it down into smaller chains of amino acids. Amino acids are joined together by peptides, which are broken by proteases. From your stomach, these smaller chains of amino acids move into your small intestine. As this happens, your pancreas releases enzymes and a bicarbonate buffer that reduces the acidity of digested food. This reduction allows more enzymes to work on further breaking down amino acid chains into individual amino acids. Body builders & athletes need extra protein to cope up with body requirement. Our body is not equipped to naturally break down and optimise the large amounts of protein. Excess protein that goes undigested in the small intestines could move into the colon where bacteria will break it down, creating ammonia that is difficult to neutralise and may build up over time. And while the body can handle small amounts of ammonia, large amounts of protein can produce more ammonia than the body can handle on its own, leading to a compromised immune system and even cell damage. Some common symptoms associated with undigested protein include gas, bloating, and diarrhoea. The solution lies with enzymes that can break down food particles into an appropriate size for digestion. The problem is that enzymatic activity naturally decreases with age. Today’s diet is largely devoid of enzyme activity since enzymes are typically destroyed by food preparation and processing techniques that involve high temperature. Supplementation with enzymes is one way to meet the digestive demands of high protein. Unived Organic Pea Protein is a scientifically formulated blend of organic pea protein isolate with natural digestive enzymes to make sure your protein is broken down into amino acids and it is available to your body for absorption. Protease – Acid Protease from Aspergillus which is fungal source. Protease – Neutral Protease & Alkaline Protease from Bacillus which is bacterial source. Papain from Papaya which is a plant source. Complete Vegetarian and Vegan formulation. Plant based organic pea protein which is as effective as whey protein. 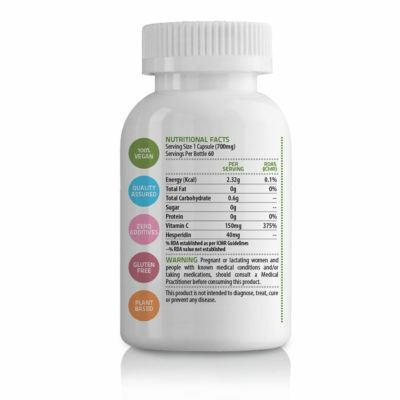 Research based and scientific digestive enzyme blend. Digestive enzymes acting at different pH and which are temperature stable. Non animal source enzymes, animal source enzymes are obtained from pancreas of animals and are processed by slaughtering of animals. Amylase is a digestive enzyme that aids in the breakdown of carbohydrates by breaking the bonds between sugar molecules in polysaccharides through a hydrolysis reaction. Amylase can be classified into three types: alpha-amylase, beta-amylase, and gamma-amylase. The three types differ in how they hydrolyse the polysaccharide bonds. Beta & gamma amylase is not found in humans. So we will continue with Alpha – Amylase. Alpha-amylase is found in saliva. As soon as you eat starch, your saliva glands secrete this enzyme into your mouth. In fact, even the thought or smell of food can cause you to salivate. Alpha-amylase in saliva digests starch into pairs of glucose molecules, which are smaller, sweeter sugars. That’s why starchy carbohydrates taste sweeter the longer they are in your mouth. Starches encounter alpha-amylase again when they reach the small intestine on their way through the digestive tract. The alpha-amylase is made by the pancreas and is secreted into the small intestine to finish digesting starches into pairs of glucose. These pairs are split into free glucose by another enzyme, and the glucose is absorbed by the small intestine to be used for energy. Glycoproteins are proteins where the protein molecule is bound to sugar molecules, which means it is difficult to break down with protease enzymes alone. Instead, they must be treated additionally with amylases to break down the carbohydrates. Source is Alpha amylase from fungi which provides benefit over bacterial amylase. It is stable at varied pH and temperature. Alpha amylase helps in breakdown of carbohydrate. 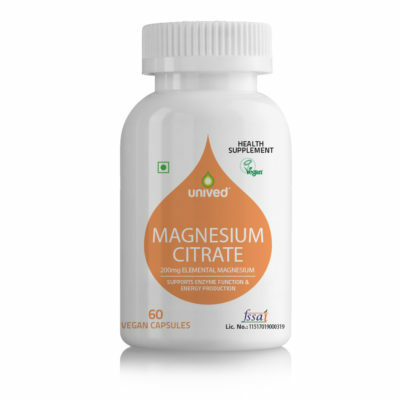 It assists Protease in digestion of pea protein. Proteases are proteolytic enzymes i.e. enzymes that break the peptide bonds in proteins and polypeptides to generate smaller peptide fragments and individual amino acids. They have numerous functions, one of which is to generate amino acids from protein in food for reutilisation. There are different types of proteolytic enzymes, which are classified according to sites at which they catalyse the cleavage of proteins. The two major groups are the exopeptidases, which target the terminal ends of proteins, and the endopeptidases, which target sites within proteins. A protein-digesting enzyme that exhibits maximum activity and stability in acid conditions (pH 2.0–5.0) and is inactivated at pH values above 5.0.The types that is useful for protein are those from Aspergillus, which resemble pepsin. Its site of action is Stomach. Gastrin stimulates parietal cells to secrete HCL. This HCL makes the stomach conditions acidic thus allowing pepsin to act. It is a type of endopeptidase. Hydrolyses protein to small polypeptides and some free amino acids. Source is Acid protease from Fungi which provides benefit over Bacterial amylase. It will hydrolyse wide range of proteins preferentially in an exo-manner, thus producing noticeably shorter chain length peptides than conventional bacterial protease. It acts at acidic pH. It initiates the digestion of protein. It is similar to Pepsin or Aspartic protease which operate at acidic pH. Site of action is stomach. Neutral protease is an extremely stable Zn-metalloendopeptidase.It is involved in the generation of beta- and alpha-amylases from the large amylase precursor. It closely resembles trypsin. It works at neutral pH of 7. It site of action is small intestine. It breaks down protein molecules in small polypeptides. It is type of endopeptidase. Hydrolyses protein to small polypeptides. Source is Neutral Protease from bacteria. It acts at neutral pH. It is secondary step of digestion of protein. It is similar to Trypsin. Its site of action is small intestine. Alkaline protease is serine endopeptidase. It is involved in the hydrolysing of peptide bonds. It works at alkaline pH of 8 to 12. It site of action is small intestine. It also hydrolyse interior peptide bonds of protein molecules. Source is Alkaline Protease from bacteria. It acts at alkaline pH. It is similar to serine endopeptidase. Papain is an endolytic plant cysteine protease enzyme which is isolated from papaya (Carica papaya) latex. It works at alkaline pH of 5 to 9. Papain shows extensive proteolytic activity towards proteins, short chain peptides, amino acid esters and amide links. It preferentially cleaves peptide bonds involving basic amino acids, particularly arginine, lysine and residues following phenylalanine. Hydrolysing of proteins, short chain peptides and amino acids. It acts at acidic to neutral pH. Its mode of action is on actual site. Amino acids are the fundamental building blocks of protein in the body, making them of one of the cornerstones of sports nutrition research. Assimilation of amino acids by the body is first step towards repairing muscle damage and building new muscle after high volumes of exercise. Post-workout, positive levels of certain amino acids in the body directly influence the rate of protein anabolism and new muscle growth. In human nutrition, amino acids are categorised as ‘Essential’ and ‘Non-essential’. Essential amino acids are hence named because they are not synthesised by the human body, and have to be ingested through food sources. Non-essential amino acids are synthesised by the body – however, physically active individuals need supplementation of non-essential amino acids because of their higher requirements. Additionally, 8 of the 11 non-essential amino acids – including Arginine and Glutamine which are key to sports nutrition – are referred to as ‘conditionally essential amino acids’. The synthesis of conditionally essential amino acids in the body is limited, especially after bouts of high exercise – making it imperative that a well-rounded sports nutrition regimen should include a source of non-essential amino acids. As it is sourced from pea protein, Unived Organic Pea Protein is a complete source of all essential and non-essential amino acids. With each serving, Unived Organic Pea Protein offers a perfectly balanced amino acid profile consisting of Aspartic acid, Glutamic acid, Alanine, Arginine, Cystine, Glycine, Histidine, Isoleucine, Leucine, Lysine, Methionine, Phenylalanine, Proline, Serine, Thereonine, Tyrosine, Valine and Tryptophan. Unived Organic Pea Protein is a rich source of BCAAs (Leucine, Isoleucine and Valine) which are of particular interest to athletes. Scientific evidence has shown that BCAAs promote muscle growth and repair after strenuous activities like resistance training. BCAAs also promote the energy metabolism as they are the only amino acids that are oxidised for energy during exercise – which means that the body does not have to sacrifice muscle mass for generating energy during exercise. Further, studies have demonstrated that post-workout supplementation with BCAAs increases the release of human growth hormone (HGH) – creating a favourable environment in the muscles for protein anabolism and muscle growth. Each serving of Unived Organic Pea Protein delivers 5.47g of BCAAs – to ensure that your workouts are optimally energised, and that your body’s resources are effectively utilised towards the goal of building lean muscle mass. 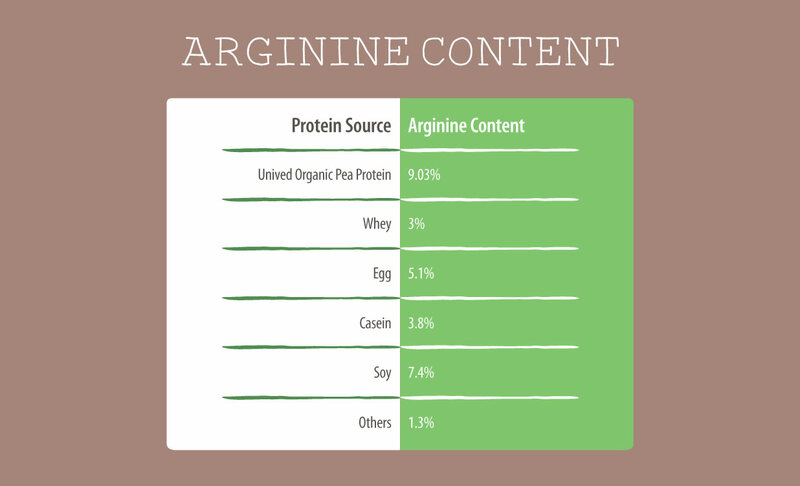 Unived Organic Pea Protein supplies 9.03% of arginine per serving – the highest among all protein sources, including whey protein. Arginine has received much focus in sports nutrition research because of its extensive role in muscle recovery and muscle performance. Studies have shown arginine to initiate protein synthesis and muscle growth after high-impact exercise. Arginine is also a promoter of nitric oxide in the human body. Nitric oxide greatly increases blood flow and delivery of amino acids to muscles, which results in better muscle pumps and superior performance during high endurance training. This amino acid also reinforces the body’s immune system- which means better recovery after exercise, and protection against oxidative stress and inflammation resulting from aerobic exercise. On the performance front, arginine has been shown to improve bench press performance and anaerobic capacity during high intensity training. With every serving of Unived Organic Pea Protein, your body benefits from the best possible arginine supplementation.Unived Organic Pea Protein equips your body to shield itself from the stress of high-impact exercise, and helps it achieve progressively better performances from workouts. Glutamine is another amino acid that has a significant impact on muscle growth. Positive glutamine levels replenish the nitrogen balance in the body. In turn, a positive nitrogen balance helps maintain an anabolic state in the body leading to the growth of new muscle – rather than the burning of muscle tissue. Intake of Unived Organic Pea Protein ensures that glutamine and nitrogen levels in the body remain conducive to the growth of new protein and lean muscle mass. Additionally, Unived Organic Pea Protein is also a good source of the amino acid Lysine, which increases the absorption of calcium by muscles, and aids in muscle recovery. Unived Organic Pea Protein out-flexes whey-based supplements with its superior digestibility, and by eliminating common problems associated with the ingestion of animal-based proteins. Digestibility is one of the most important benchmarks for determining the efficiency of a protein supplement. Animal protein is built differently, and in order for the human body to utilise the amino acids in animal protein, the body has to expend more energy into digesting it and breaking it down into amino acids. As a completely plant-based supplement, Unived Organic Pea Protein has an extremely high digestibility of 98%, making it a rich source of highly bio-available and easily accessible amino acids. Pea protein is also classified as an ‘Intermediate-Fast’ protein. This means that once digested, pea protein is quickly assimilated by the body for protein synthesis, while ensuring that the muscles get a consistent and prolonged supply of amino acids. The intermediate-fast absorption rate combined with Unived Organic Pea Protein’s high digestibility gives your body all the resources it needs to repair post-exercise muscle damage, recover comprehensively, and build new muscle. With Unived Organic Pea Protein, athletes can avoid the common digestive discomfort associated with whey-based proteins like flatulence and constipation. The lactose present in whey-based supplements is the most common cause of digestive distress – especially in lactose intolerant individuals who lack the enzyme necessary to break down the lactose sugar in whey protein. In the absence of this enzyme, lactose sugar is not digested properly, leading to abdominal pain and diarrhoea. Even if lactose is removed from whey protein, digestive discomfort can persist with whey-based supplements. As whey is an animal-based protein, it contains very little fibre. The lack of dietary fibre can lead to constipation and irregular bowel movements, which can be rectified only by the consumption of high-fibre foods in addition to whey. As a completely plant-based vegan protein, Unived Organic Pea Protein is naturally high in fibre in addition to being highly digestible. Unived Organic Pea Protein eliminates the common digestive side-effects associated with whey protein, and is completely gentle on your stomach – with no side effects. PDCAAS (Protein Digestibility Corrected Amino Acid Score) is a standardised method to evaluate protein quality based on nutritional requirement in humans and their ability to digest protein. On a scale of 0-1, pea protein has high PDCAAS score of 0.93 – which is equivalent to the PDCAAS score of sources of meat, eggs, and soy, and far superior to that of common vegetables found in the regular diet like spinach and broccoli. Unived Organic Pea Protein delivers high quality pea protein isolate that is equivalent in nutritional quality to traditional animal-based supplements, along with the superior digestibility of plant-based protein. Along with being a rich source of unsaturated fatty acids, plant-based proteins like pea protein contain low levels of saturated fat, a factor which promotes HDL (“good cholesterol”) levels in the body. As a 100% plant-sourced supplement, Unived Organic Pea Protein is 100% cholesterol free, and does not contribute to dietary cholesterol, unlike animal & dairy sources. Unived Organic Pea Protein is hypo-allergenic, making it a suitable and safe choice for people who are allergic to milk and whey products, those with lactose intolerance, those allergic to soy products, or for those athletes who avoid animal-derived products because of ethical reasons. Unived Organic Pea Protein has a complete and perfectly balanced amino acid profile, without the addition of any synthetic amino acids. As plant-based protein involves significantly less industrial processing and carbon emissions, Unived Organic Pea Protein is an environmentally friendly protein.Unived Organic Pea Protein is also compassionate way for individuals to meet their protein requirements, as it contains no animal-derived ingredients, and is 100% vegan, GMO-free, and dairy-free. Unived Organic Pea Protein is effective if you want to gain lean muscles mass and decrease muscle damage. It helps enhance your energy and stamina, which aids you to workout for long hours at the gym. With 30 grams of pea protein isolate, it helps in the synthesis of muscle protein. This speeds up the muscle recovery process. Unived Organic Pea Protein also increases the supply of blood to the muscle tissues, which in turn increases the transport of nutrients to the muscles, aiding in the fast recovery of muscles. The balanced and complete amino acid profile of Unived Organic Pea Protein gets absorbed into the muscle cells quickly and provides you with the immense benefits of pea protein. Unived Organic Pea Protein is especially recommended for endurance athletes to maintain, repair, and grow lean muscle mass, as well as, support immune system function. Endurance athletes with low dietary protein increases recovery time between workouts, causes muscle weakness, and suppress the immune system. Protein deficiency will make your training obsolete leaving you susceptible to fatigue, muscle soreness, lethargy, and other severe disorders. Incorporating a high-quality protein supplement to your training arsenal, provides the essential and non-essential amino acids required to reduce tissue cannibalization. With the consumption of Unived Organic Pea Protein you will increase lean muscle mass, reduce muscle damage, improve endurance levels, and reduce recovery time without sacrificing your hard work during training. While Unived Organic Pea Protein is especially beneficial for athletes, it is also ideal for anyone looking to supplement their diet with a high-quality protein to meet their daily intake requirements. Unived Organic Pea Protein provides plant-based vegan pea protein isolate that is superior to the protein found in common vegetables and it is a highly nutritious source for individuals with exclusionary diets like vegans and vegetarians, to ensure that they meet their recommended dietary intake of protein. Individuals with lactose intolerance and soy allergies can benefit from Unived Organic Pea Protein, as it is free of major allergens. Regular consumption of Unived Organic Pea Protein is beneficial for anyone who wants to raise the nutritional heft of their diet. Unived Organic Pea Protein can be taken at any time during the day. You can simply put in a shaker, make a smoothie with it, or bake some baked goodies with it. For athletes or gym junkies, it is suggested to take at least one serving of Unived Organic Pea Protein within 45 minutes post your workout and another serving before bedtime. For endurance athletes, Unived Organic Pea Protein can be taken in conjunction with RRUNN™ Post Complete System Recovery. Unlike conventional whey supplements and other plant-based proteins, Unived Organic Pea Protein is completely free of synthetic or natural emulsifiers and thickeners. For a smoother shake, we recommend using a blender; however, a shaker will also work just fine. 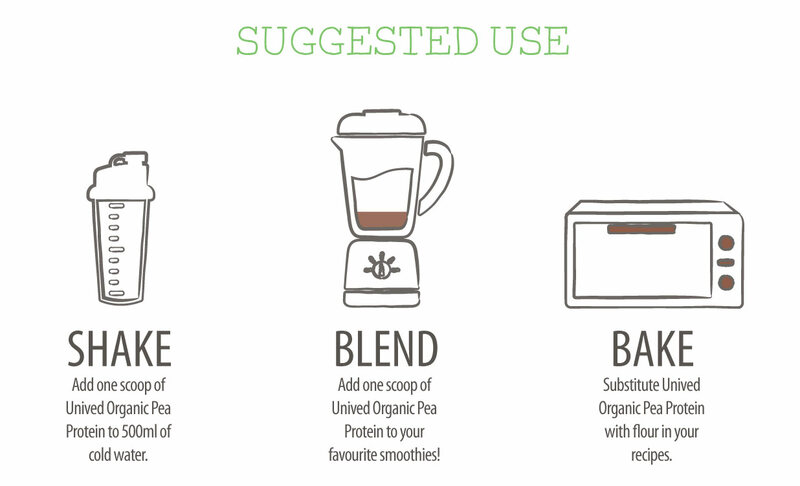 To make one serving of Unived Organic Pea Protein, add one scoopful to 500 ml of cold water or your favourite nut milk in a blender or shaker, and blend/shake until you get a rich, smooth and delicious shake. The recommended dietary intake of protein depends on factors like weight, the level of physical activity, and the nutritional goal in mind. For e.g. the protein intake of an athlete training for a demanding sporting event will be greater than that of a sedentary individual. Unived Organic Pea Protein can be be consumed at any time of the day, the best time to have it within 45 minutes post workout. However, it can be had before exercising and before bed. As a basic guideline, we recommend that adults should consume 1-1.2 grams of protein per kilogram of body weight to meet their dietary requirements of protein. Physically active adults and athletes should consume 1.5-1.8 grams of protein per kilogram of body weight to sustain their training and meet their elevated protein needs. We recommend consuming a minimum of one serving of Unived Organic Pea Protein per day, although, you may take upto 3-4 servings if desired. Unived Organic Pea Protein strictly adheres to WADA (World Anti-Doping Agency) guidelines, and does not contain any banned substances. However, please note that WADA does not offer any certification, or confirmation (written or otherwise) of the same. Note: Pea protein as such does not taste as great. One cannot compare this to Whey protein and/or expect any pea protein product to taste like Whey. If you are big on taste and cannot do without the regular high-sugar rich chocolate taste – then this product may not be for you. 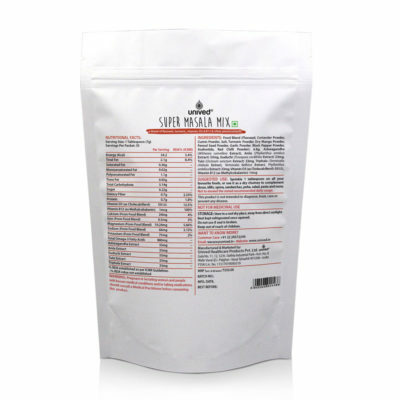 If you are looking for a superior product, a clean product, and are more concerned about getting your 30 grams of protein from a sustainable and clean source, and if you can accept a small compromise in taste – then this is just the product for you. It does NOT taste ‘bad’ – but it does take some getting used to. What is organic pea protein isolate? Organic pea protein isolate is the purest form of pea protein, containing 80% pea protein. Pea protein is an animal-free supplement made from extracting the soluble pea protein from yellow split peas. The process for extraction is mild without the use of chemical solvents; thus, the functional properties are maintained and deliver nutritional value. Pea protein is also hypoallergenic making ideal with for lactose intolerance and soy allergies. Digestibility is one of the most important benchmarks for determining the efficiency of a protein supplement. Animal protein is built differently, and in order for the human body to utilise the amino acids in animal protein, the body has to expend more energy into digesting it and breaking it down into amino acids. As a 100% plant-based vegan protein, pea protein has an extremely high digestibility of 98%, making it a rich source of highly bio-available and easily accessible amino acids. How much protein will I get by consuming Unived Organic Pea Protein? You get 30 grams of organic pea protein with each serving. Depending on your weight and level of physical activity, you should easily be able to tailor your intake to meet your recommended dietary intake of protein. Please refer to our intake guidelines mentioned above to determine how much protein your body requires. 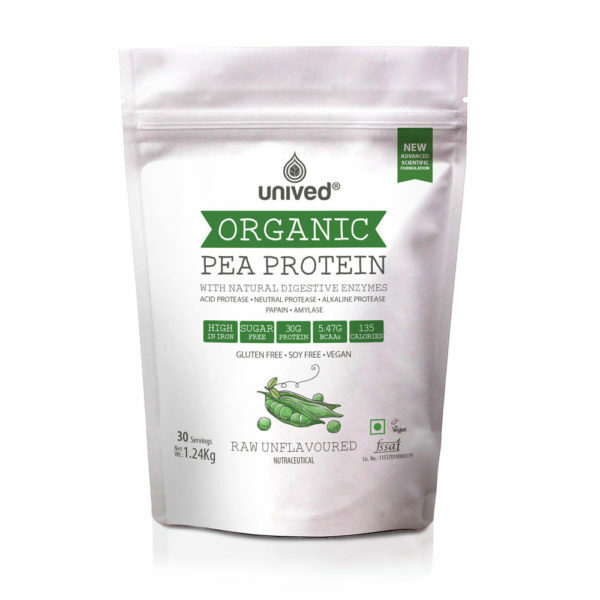 How is Unived Organic Pea Protein different from whey protein? Unived Organic Pea Protein is 100% plant-based, vegetarian and vegan – meaning that it’s not derived from an animal source like whey protein. It has higher arginine content (9.03%) than whey protein (3%), an important amino acid as it plays an extensive role in muscle recovery and muscle performance. 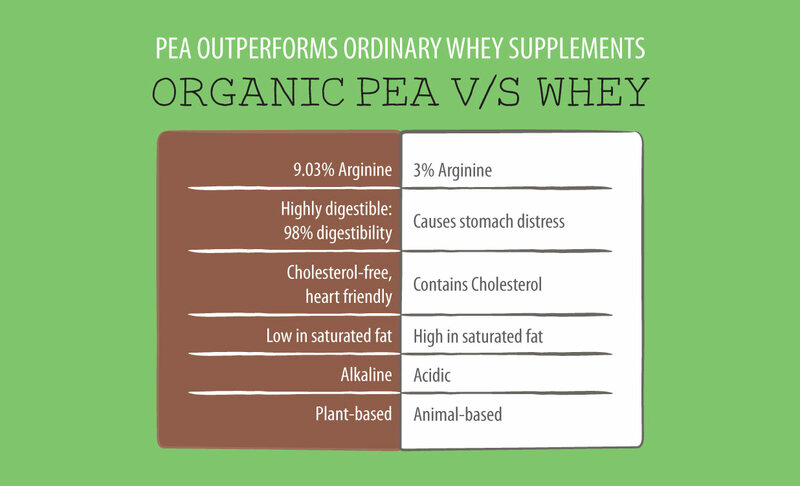 Unlike whey protein, Unived Organic Pea Protein is hypoallergenic – free of all major allergens attributed to soy and whey proteins. 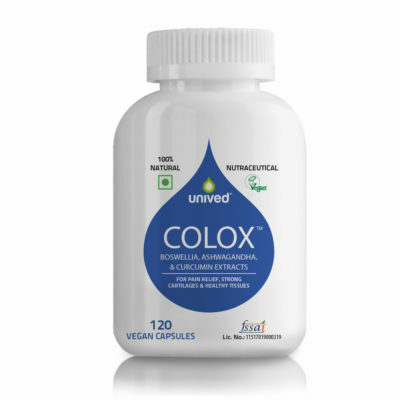 With 98% digestibility and natural digestive enzymes, it is easy on the stomach without the digestive side-effects of whey like constipation. Unived Organic Pea Protein is also 100% cholesterol free and low in saturated fat. What does it mean when product label says “Plant-Based Protein”? Plant-based signifies that the protein source is from a pure plant source (yellow peas) and not whey, egg, or other animal derived protein source. Why should I opt for Unived Organic Pea Protein as my protein supplement? Unived Organic Pea Protein is formulated with pure organic pea protein isolate – a plant-based vegan protein – proven to be as effective as whey protein. It is ideal for those who aim to build lean muscle, decrease recovery time between workouts, and increase muscle performance. As a plant-based protein with a complete and balanced amino-acid profile, it serves as the ideal protein supplement for weight lifting, resistance training, high endurance activities, and anyone looking to supplement their diet with a high-quality protein. Who can use Unived’s Organic Pea Protein? Our product can be used by anyone who wants to improve the protein intake in their diet. Protein is especially recommended for individuals who want to increase their lean muscle mass, and athletes who want to improve their performance in areas like weight training, resistance training, and high endurance activities. It is also ideal for vegetarians, vegans, and anyone that is lactose intolerant. Is Unived Organic Pea Protein recommended only for bodybuilders? Protein is one of the macronutrients, which is required by everyone. Protein is the building block of muscles. It is necessary for building up of the muscles; hormone and enzyme formation; strength and stamina; and healthy skin, hair and nails. Unived Organic Pea Protein provides pea protein in its purest form, which benefits by improving muscle tone and immunity, and helps meeting the daily requirement of protein. You don’t have to be a bodybuilder to consume a quality protein supplement. Individuals lacking protein in their diet are recommended to supplement their protein intake with a pure protein source like pea protein. I am an athlete. How can I benefit by consuming Unived Organic Pea Protein? Studies have shown that athletes have higher requirements of protein than sedentary individuals. With highly digestible pea protein and a complete amino acid profile, our protein has been scientifically formulated to meet the special nutritional needs of athletes. You will experience wide-ranging benefits like growth in lean muscle mass, improved performance, fewer cramps, less fatigue, and faster recovery times. What do you mean when you say that it is a ‘vegan protein supplement’? Unived Organic Pea Protein is a 100% plant-based vegan protein from pure organic pea protein isolate. It is certified Vegan by the Vegan Society – UK, as it does not contain any ingredients derived from animals, nor has it been tested on animals. Our protein is also manufactured in a 100% vegan facility. Will I face digestibility issues with Unived Organic Pea Protein? Absolutely not. Our organic pea protein isolate, has a high digestibility of 98% and has been specifically formulated to eliminate the digestive issues commonly associated with animal-based protein like whey. 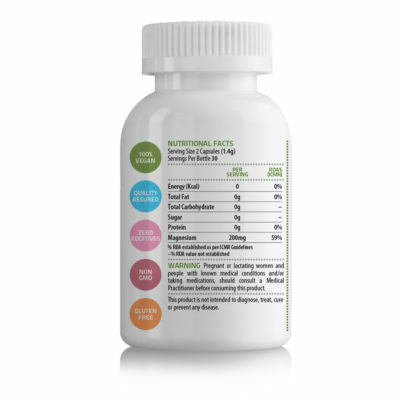 We have also included a special blend of natural digestive enzymes to help aid the digestion and breakdown of protein in your gut. You will not experience the common side-effects of protein supplementation like constipation, gas and digestive distress. Unived Organic Pea Protein is completely gentle on your stomach and allergen free. What is a PDCAAS score? PDCAAS is a score used to assess protein quality based on human nutritional requirements and the ease of digestibility of protein. This score, which ranges from 0 to 1, has been adopted by the W.H.O as the gold standard to evaluate protein quality. Unived Organic Pea Protein has a high PDCAAS score of 0.93, which means it scores high on both – the quality of the protein, and the digestibility. Does organic pea protein have a complete amino acid profile? 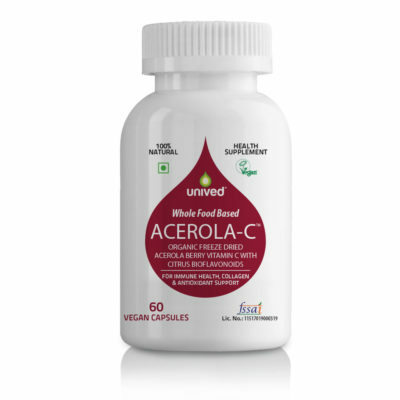 Yes, it has a complete and balanced amino acid profile of essential and non-essential amino acids, and fulfils all the requirements defined by the W.H.O for adults. Organic Pea Protein is particularly high in BCAAs, glutamine, and arginine to benefit physically active individuals and regular individuals alike. 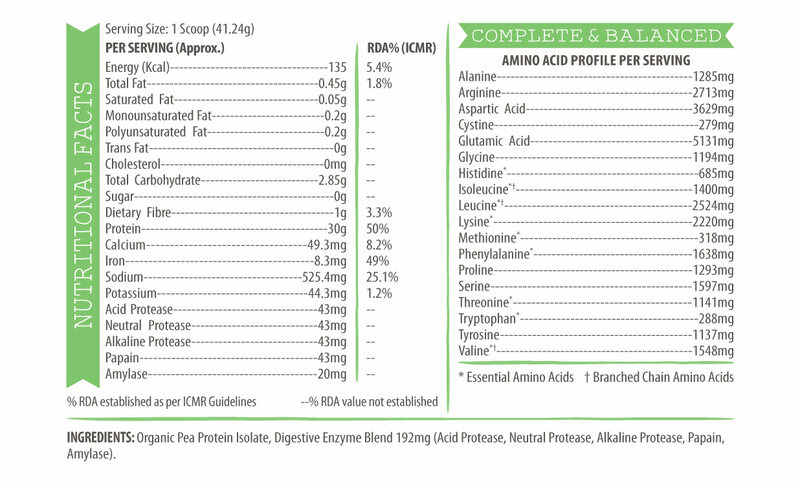 As part of a complete and well-balanced amino acid profile, our protein contains BCAAs (Branch chain amino acids. BCAAs – which comprise of Leucine, Isoleucine and Valine – are crucial to the process of protein synthesis, and therefore, to the growth of new muscle. Scientific studies have shown BCAAs to have specific benefits for athletes, including energy generation during exercise, and muscle and muscle repair after intense exercise. Are there any side effects/contradictions associated with consumption? There are no known side-effects or interactions associated with consuming pea protein, and it is completely safe for long-term use. However, if you are pregnant, breastfeeding, or if you suffer from a serious medical condition, we recommend that you consult your physician before consuming. Is Unived Organic Pea Protein hypoallergenic? Yes. The organic pea protein used is not classified as a major allergen. Furthermore, it is safe for individuals who are lactose intolerant, allergic to milk and milk products, and soy products. Our organic pea protein is also gluten-free. Does Unived Organic Pea Protein contain sugar? No. it is completely sugar-free, suitable for diabetics. Is it suitable for vegans and vegetarians? Yes. 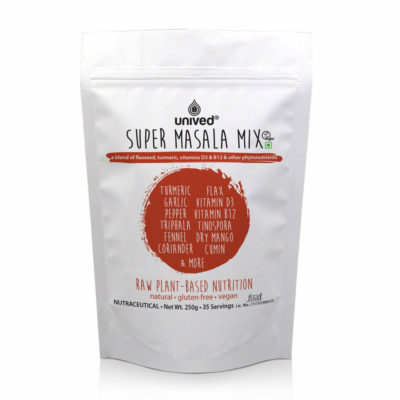 it is 100% a vegan protein and certified Vegan by the Vegan Society – UK. Made from organic vegan pea protein isolate. It is free of any animal-derived ingredients and has not been tested on animals. Does Unived’s protein contain any synthetic amino acids? No. 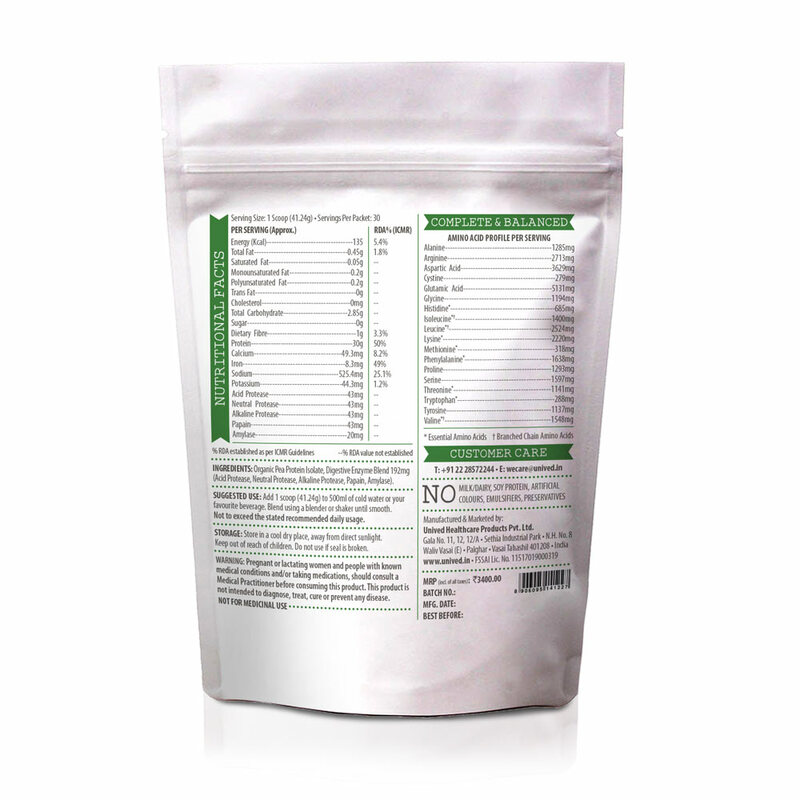 We do not add any overages or any additional ingredients to increase the amino acid profile. Your protein requirement depends on your weight, intensity of physical activity, and your training goals. Please refer to our intake guidelines table to determine how much protein you should be taking. When should I consume the protein? We recommend taking our organic pea protein within 45 minutes of your workout, but it can be taken at any time of the day, as per your convenience and preference. How should I consume your protein? As a vegan protein supplement, it works best when consumed with water. For best results, mix one serving in 500ml of water. Mix well in a shaker cup or blender till the powder dissolves. Take at least one serving a day, or as per your daily requirements. We recommend using a blender instead of a shaker for best results. Our organic pea protein can be consumed with RRUNN™ Complete System Recovery. I am not an athlete. Can I still consume Protein? Absolutely. Protein is for everyone who wants to raise the nutritional profile of their diet with a superior protein supplement. We especially recommend protein for individuals with exclusionary diets like vegans and vegetarians, as their regular diet might not meet the recommended intake. Pea protein supplies you with a high-quality protein, regardless of your activity levels. 2. Armsey & Grime TE, Protein and amino Acid supplementation in athletes, Current Sports Medicine Report. 2002 Aug;1(4):253-6. 6. Fuhrman and Feiri, Fueling the Vegetarian (Vegan) Athlete, Current Sports Medicine Reports: July/August 2010 – Volume 9 – Issue 4 – pp 233-241. 8. Pins and Keenan, Effects of Whey Peptides on Cardiovascular Disease Risk Factors, The Journal of Clinical Hypertension, November 2006, Volume 8, Issue 11, pages 775–782. 9. Phillips SM, Protein requirements and supplementation in strength sports, Nutrition, 2004 Jul-Aug;20 (7-8):689-95.